As a child, did you ever try to eat dirt or sand? Pica is the name for eating nonedible things, and while it’s normal for a curious child to try dirt once or twice, it becomes a much odder—and potentially dangerous—practice as people get older. People who eat nonedible things should be examined by a doctor and psychologist to determine the cause. Many people with pica have experienced trauma, neglect, or abuse. Some people with autism or OCD eat non-food items. Occasionally, pregnant women and young children eat non-food items because they’re anemic or lacking in a nutrient. Pica can also be a cultural norm. Many people in Africa eat clay to prevent mineral deficiencies. Slaves in the southern United States ate kaolin rock because it contains a chemical that prevents diarrhea and stomach problems. In fact, the original formula for Pepto-Bismol contained kaolin. People eat a variety of items, including sharp objects, clay, dirt, feces, hair, ice, rocks, or paper. Eating these items can be dangerous. Chemicals in paint chips and other objects can cause brain damage, cancer, or infertility. Parasites in dirt and feces cause serious illness. Eating sharp objects, glass, or rocks can cause stomach injury. Question: What do doctors do to treat pica? Answer: Most doctors start with behavioral strategies designed to curb the behavior while addressing underlying issues. Sometimes people are given medication to stop their desire to eat non-food items. Find out more about pica. Declan, Tobin. " 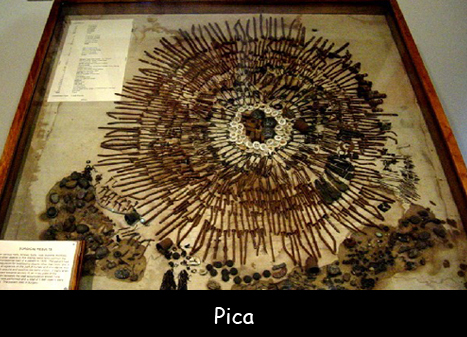 Pica Facts ." Easy Science for Kids, Apr 2019. Web. 25 Apr 2019. < https://easyscienceforkids.com/pica/ >.